Welcome to the HUTC Blog, sharing some of our experiences as we cover the more unusual news stories, travel to far flung places and meet the most engaging people doing extraordinary things. Enjoy the read, or better still if you have a story that needs exposure to a wider audience, get in contact, you may just become part of our next blog! The British Speedgolf season has just kicked into life. It’s a great sport to cover for many reasons. I normally book a couple of cameraman who chase the Speedgolfers during their round in golf buggies. 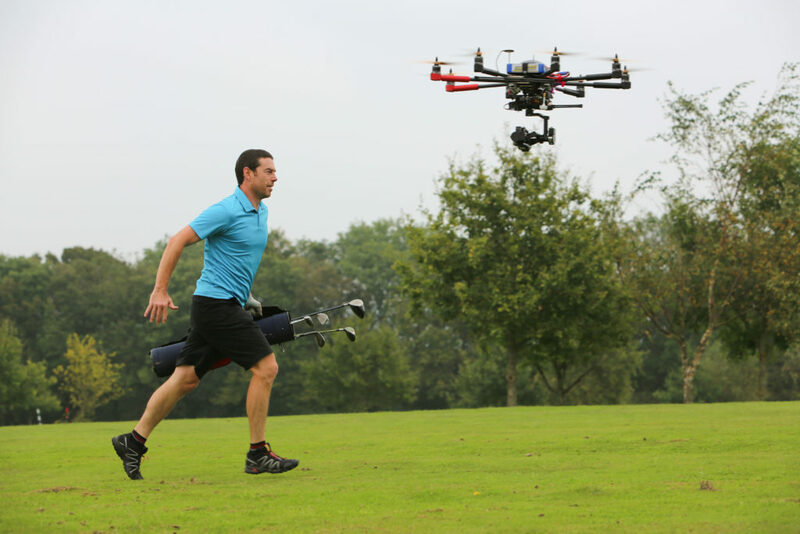 We were one of the first to use a drone at the British Open a few years back, which caused quite a stir, especially when British Speedgolf put out this shot on its social media! Safety is paramount now for Drone operators (our drone guys are CAA register pilots before you ask) but this gives us some of the most unusual golf shots you will encounter. Speedgolf provides a fast pace tournament with competitors set off at intervals playing 18 holes, all over before lunch…what’s not to like! The sport appeals to people who love their golf but can’t find the time to play with work and family commitments – plus those who enjoy running and having fun, there is a really nice sporting spirit at the events. Speedgolf offers a faster, more athletic version of the game, where a player can complete a full 18 holes in under 60 minutes, or 9 holes in under 25 minutes, by jogging between shots. The challenge for players is to balance their running pace with their ability to quickly and accurately play shots to get their lowest score possible as golf shots and time are combined for a Speedgolf score. With our increasingly sedate lifestyles, Speedgolf has health and fitness benefits as well. Playing nine holes at running pace can be fitted in to 25 – 40 minutes; players will jog two to three miles depending on their golf accuracy, take over 5000 steps and burn over 850 calories. This year is an exciting year for this sport; a new international alliance has formed to include the UK, US, Australia, New Zealand and Japan. 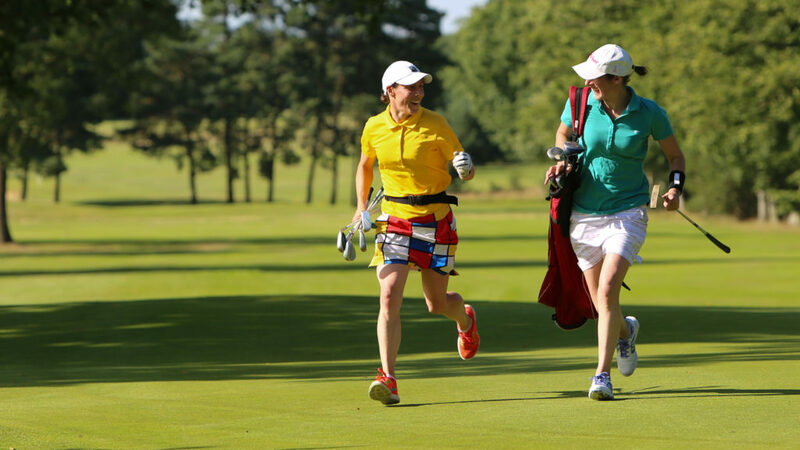 In the UK a brand new Pairs Championship will be hosted at West Kent Golf Club on 22 July, followed by the British Open Speedgolf Championships on 9 September at the prestigious Piltdown Golf Club in East Sussex – voted one of the top 50 golf clubs in England. With just 40 tees available at the latter, it is short odds to become a British Champion! The sport is capturing the imagination of players across the globe and this October, the US will not only host their US Open Championship, but the World Championships will also a few days later in New York State. The UK is hoping to assemble a team! 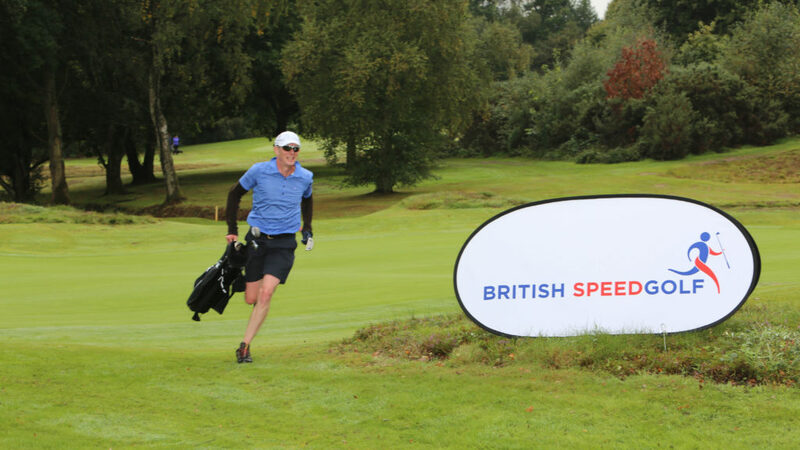 Here is a report from last year’s British Open Speedgolf Championships, registration for this year’s championships are open now Enjoy! With the World Cup kicking off in Russia later this month, I thought I would delve into my archives for this week’s blog. Blairmore in Scotland is a shade over 2,200 miles away from Moscow in Russia, but it might as well be Mars with regards to the beautiful game. 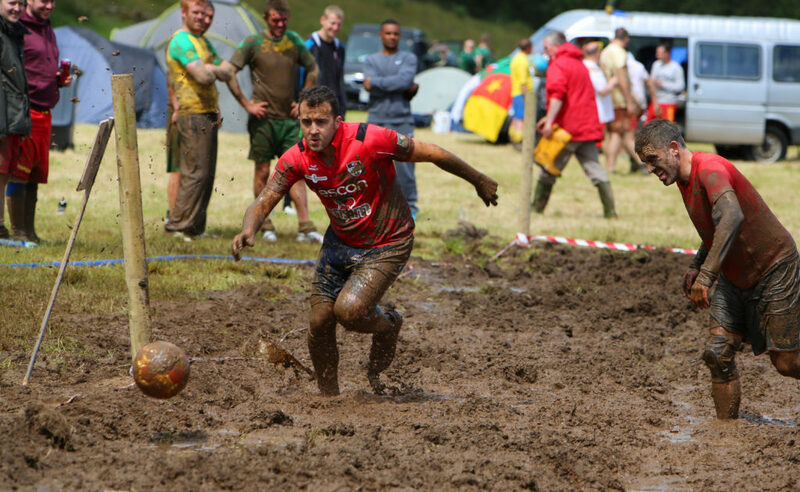 It was back in June 2014 when the small Scottish village played host to the filthiest game of footy you are ever likely to see. It was a pleasant enough journey, the location was on a remote peninsula in Argyll and Bute – just getting onto the old ferry across Loch Lomond all added to the adventure. Normally when you arrive at a football match, you are greeted by overzealous members of security who after much huffing and puffing will finally thrust a lanyard around your neck. So, it was a convivial surprise when I turned up at the stadium, I say that, it was a dodgy looking field, to see the local farmer churning up the so-called pitch with his tractor and another guy holding a hose flooding the whole area. This could be a bit of fun I thought as I squelched my way back to my car, although I could have done with some wellies! 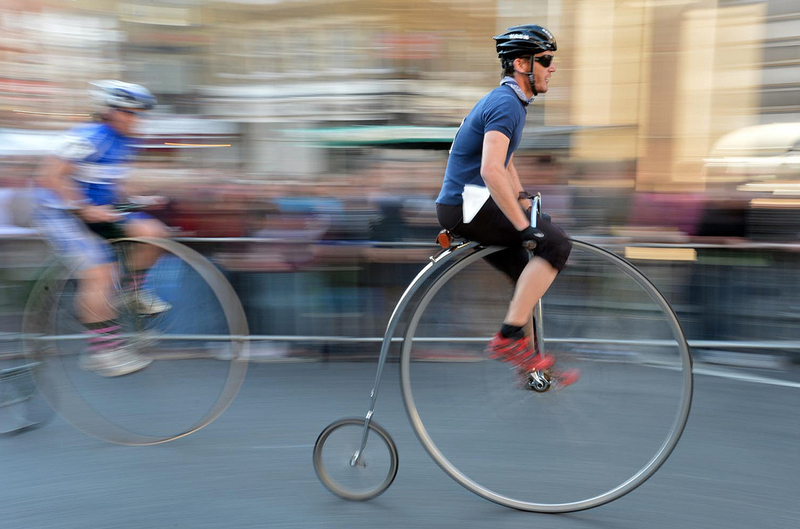 This so-called sport is fast becoming a worldwide phenomenon. It apparently originated in the swamps of Finland back in 2000; they found it to be an excellent means of training for cross-country skiing, apparently. 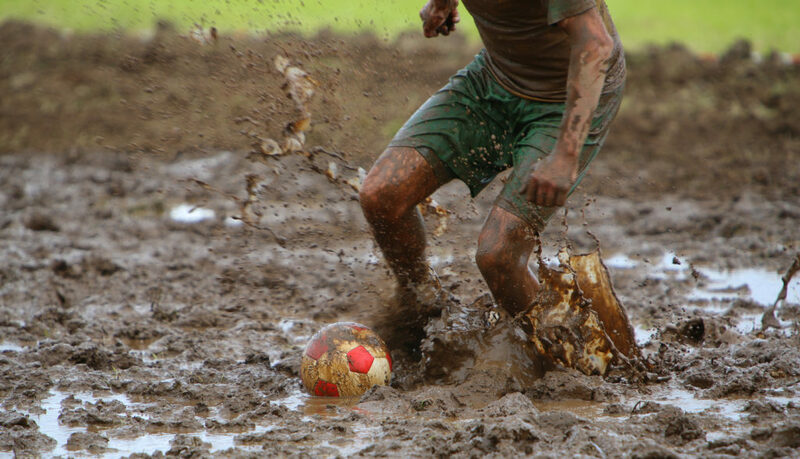 Swamp soccer tournaments are held across the globe with countries such as Brazil, Turkey and China now getting involved. 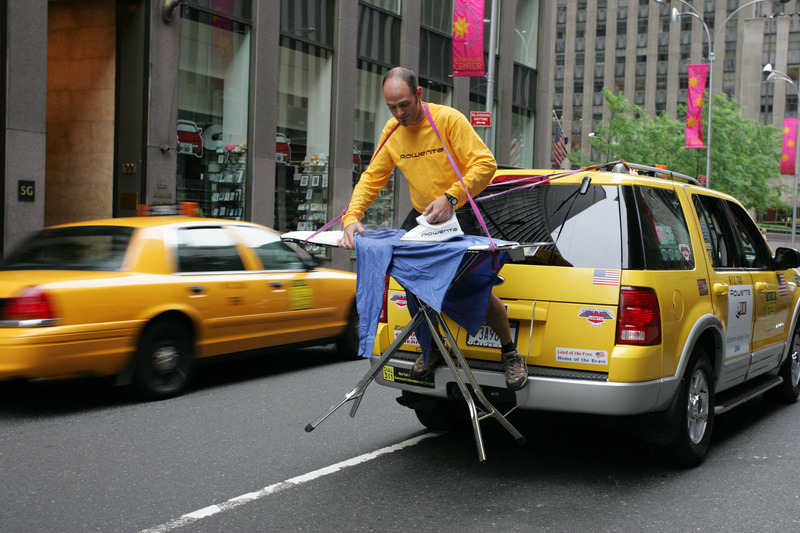 Surprisingly, no training is required; but the player’s do require real guts, coordination, determination and an extremely good washing powder. 16 teams packing their home and away kits for a dirty weekend north of the border with names such as ‘Mud, Sweat & Beers’, ‘Mudwatch’, ‘Real Manky’ and ‘Whitby Walruses’ the tournament was always going to be fun affair. The World Cup was open to everyone over the age of 17 years -old with teams of all male and mixed. Each team consisted of 6 players but teams could draw on an unlimited supply of substitutes throughout the match. 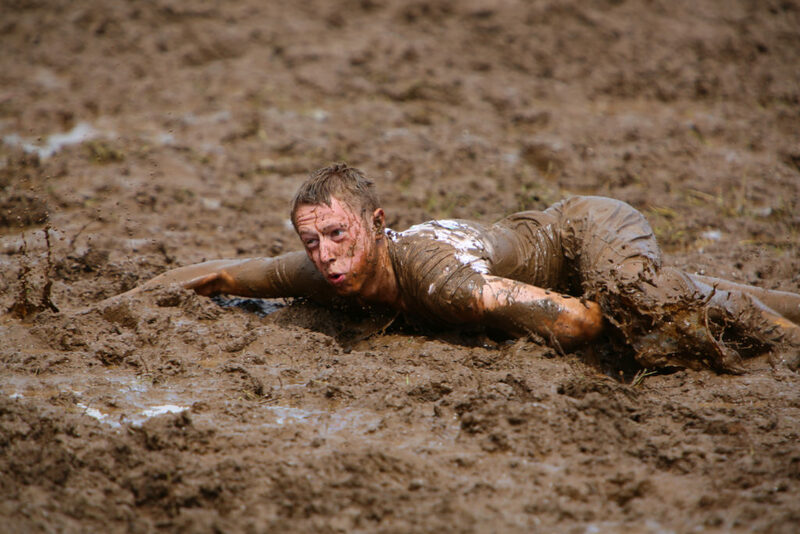 Each match lasts 24 minutes and watching some of the better teams who had played before to skill was to keep their players moving all the time otherwise as ‘newbies’ found out you sink into the boggy pitch and can’t move. Unlike the 2018 World Cup which is spread over 6 weeks, this quirky tournament only lasted two-days. In the mixed team final Turkish team ‘Erisim Istanbul’ lost on penalties (4-3) to ‘Yipee Ki Yay Mucky Fudders’ – I had to type that one carefully when filing back to our client. In the Men’s final ‘Team AKA’, from Scotland, beat fellow countrymen ‘Deportivo Lack of Talent’ 3-1. 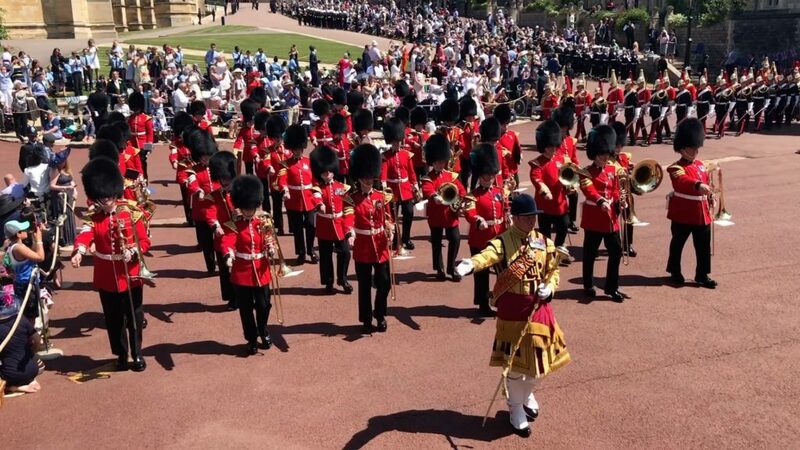 We Brits are pretty good at pomp and ceremony. 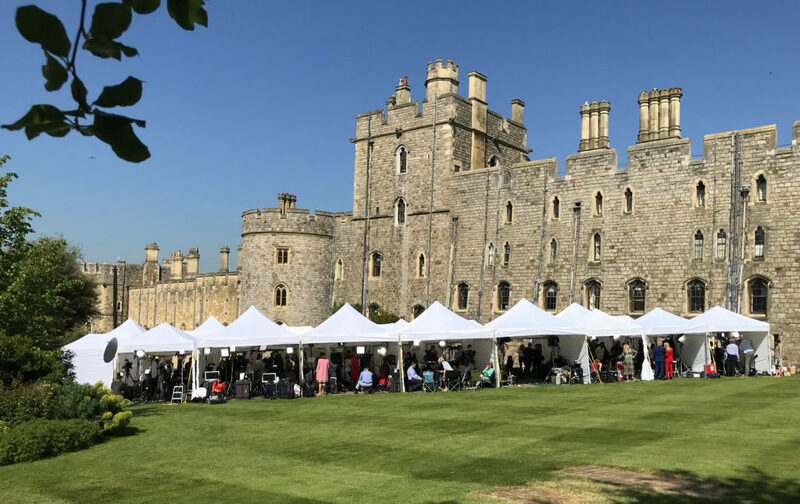 Being one of 5,000 journalists and media workers that had been accredited to cover the Royal Wedding my first thought was that it was going to be one hell of a long queue at security…. I was right – it took me nearly two hours to get the four wristbands that I needed. Interest from the US media was enormous, whilst in the queue I was talking to a women from NBC who was one of over 230 that had been sent over to cover the event. The mind boggles at what they all did! Still, the local hotels and restaurants were complaining. 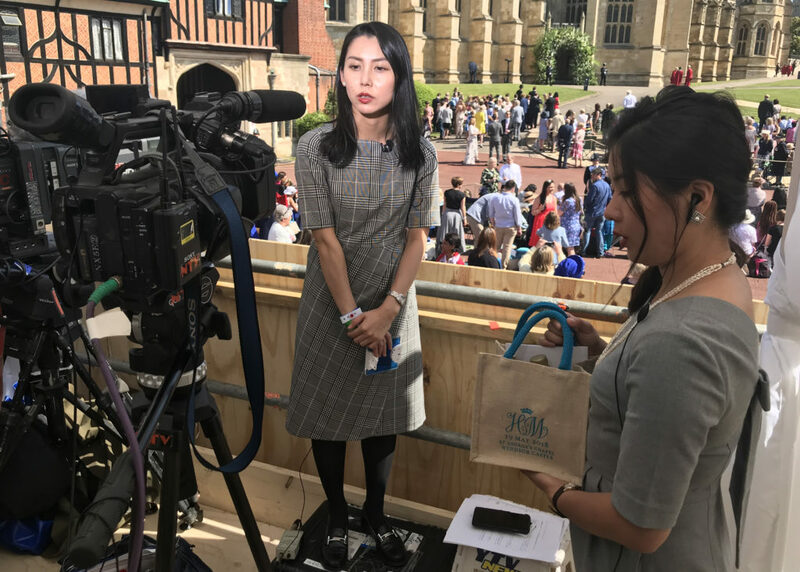 My role for the event was working with the Japanese broadcaster Nippon TV during their two live hits. We had an amazing ‘live’ position as it was inside the castle grounds, which gave them a great view of proceedings and fortunately all went tickety-boo. For me one of the best moments was looking at all the faces of the assembled media listening to the most Reverend Michael Curry, the Afro-American leader of the Episcopal Church in the US. His sermon was both passionate and entertaining, although it did last rather too long, which meant that we had to push back one of their our live hits, but no real drama. Not being a huge royalist, I had mixed views before the event but whatever our thoughts of the Royal family, the broadcasting of the Wedding across the globe was a magnificent advert for UK PLC; even the sun came out for the day ensuring proceedings looked even more splendid! The two-hour flight from Spitsbergen is pretty uncomfortable as the Antonov plane that is used does not have many luxuries. These planes were built for Arctic work; they mainly shift goods around rather than athletes and members of the press. 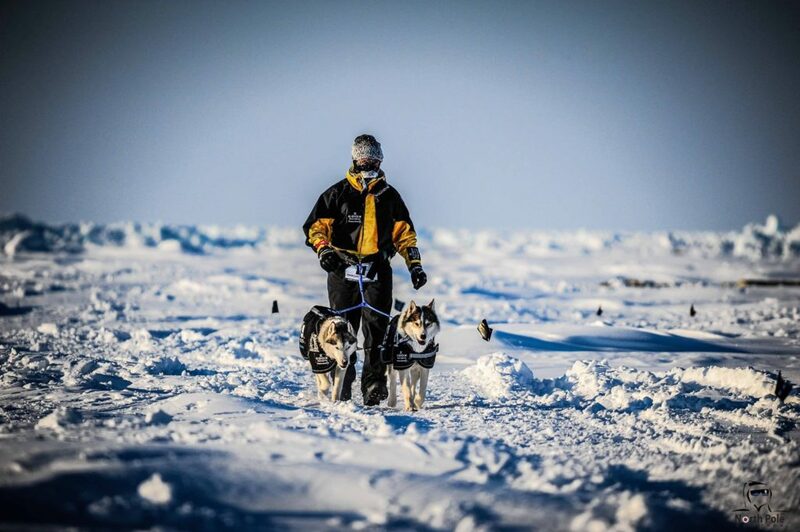 The marathon operates from a drifting Russian camp base at the Geographic North Pole –it is the only race in the World that is run on the waters of the frozen Arctic Sea ice. 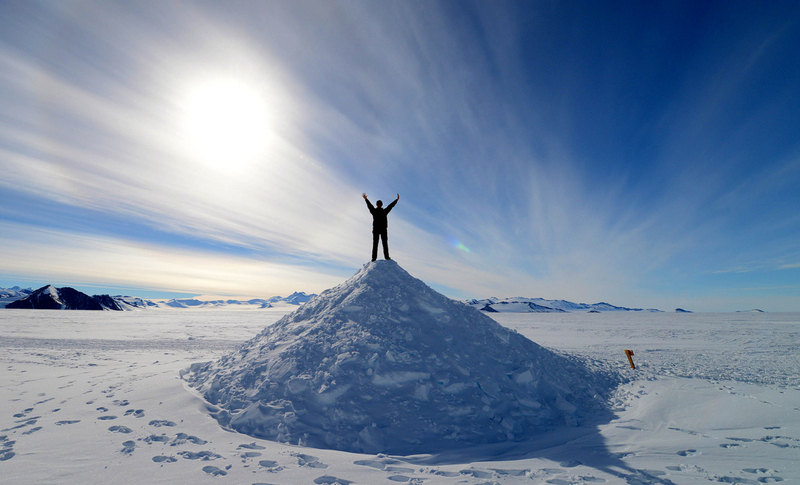 Camp Barneo, otherwise known as the North Pole Camp is located approximately 49 kilometres from the top of the world. As I looked at my GPS watch I can quite clearly see that we were drifting about in the Arctic Ocean – northerly winds push the floating camp towards the southeast at up to 0.5mph – a little bit scary if you sit down and think about it. Richard Donovan, the race organiser and all-round top geezer, marks the marathon course out around the camp. This is for safety reasons; well you wouldn’t want to get lost out here that’s for sure. The runners this year had to complete 10 laps but they were able to retreat into a refreshment tent every lap to regain body warmth and hydrate themselves with hot drinks and snacks. Everybody needs to protect their skin against the harsh conditions. Our clothing included a full faced balaclava, goggles, gloves and mittens, long johns and several layers of thermal clothing under a ‘shell’. This year, 60 athletes from over 20 Nations took part; China had a significant entry with 13 athletes vying for glory. The race started at 10:35 Sunday evening (15th April) with a temperature of ¯30° degrees Celsius. 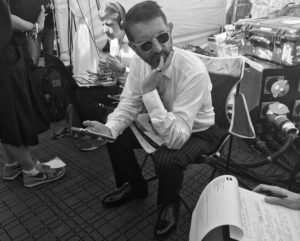 That time of year there is 24 hours of daylight, so it was a bright sunny outlook throughout the race. This year’s winner was the wonderfully named Greek runner Argyrios Papathanasopoulos, transpires he’s an emergency physician now living and working in Halifax, England. 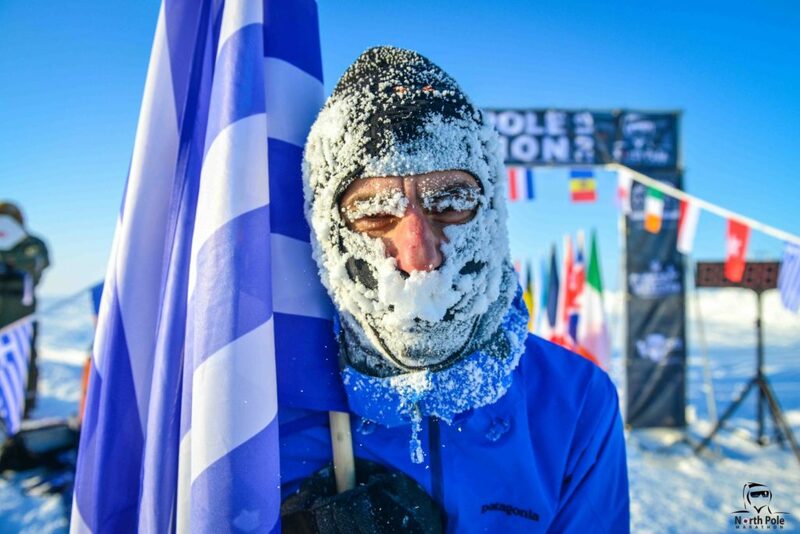 I was thrilled for my Aussie chum Marcus Fillinger who ran the race with two husky dogs called “Blue and Duro” as they now enter the record books becoming the World’s first dogs to complete the North Pole Marathon. 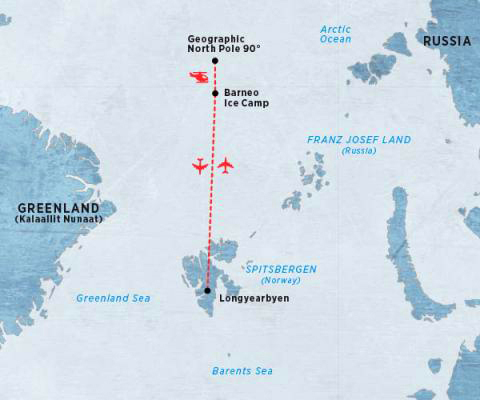 Later this week I’ll be heading up to The Barneo Ice Camp at the geographic North Pole. 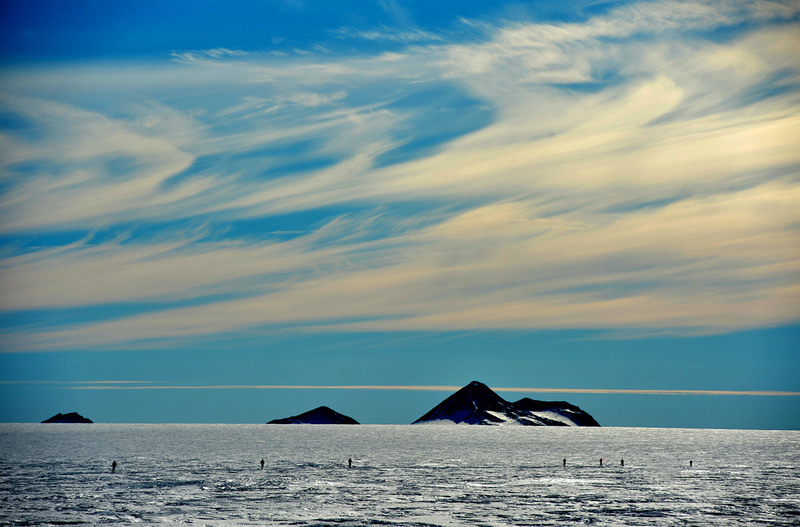 It’s one of the most remote scientific research stations on the planet. It will be my nineth time that I will have visited this camp; nothing comes close to this surreal experience. 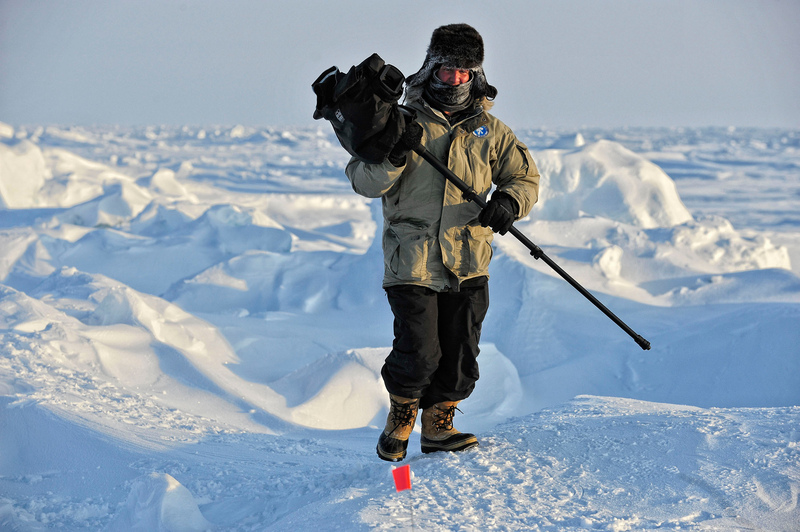 I am extremely lucky and very privileged to cover the ‘World’s Coolest Marathon’ – The North Pole Marathon over the last decade. This year we have been delayed by a week, actually all Arctic travel to the region has been delayed; the Russian’s are in charge, so perhaps we will know more on arrival. Our Russki friends call their camp on the sea-ice, only 1° away from the North Pole, “Barneo” because it’s not Borneo… that’s a Russian sense of humour for you! They may not share our wit, but their inventiveness, persistence and just good old fashioned guts in setting up the camp on the sea ice is second to none. Barneo is a private temporary camp, each year it is assembled from scratch; helicopters take off from Siberia in search for a good, stable location. The frozen landscape at the Pole is constantly moving and the depth of the ice from one year to the next is unpredictable. They refuel on an island called Sredny and then head towards the North Pole. Once a suitable site is found on the sea ice, paratroopers are airdropped to set up a basic camp, they transmit their coordinates back to HQ , where an Ilyushin Il-76 cargo plane chocked-full of fuel and supplies will follow. They fly in 50 tonnes of equipment – including a tractor with a bull-dozer for smoothing the ice to make a runway. 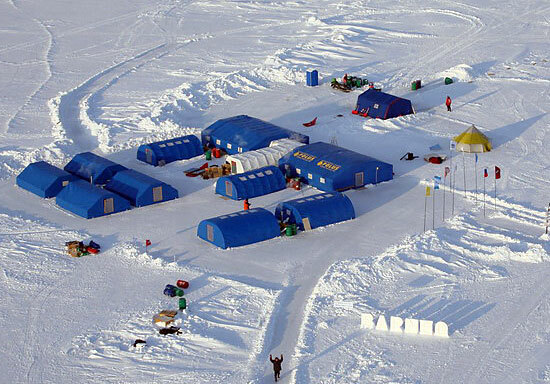 The camp is only operational for a matter of a few weeks each year becoming the gateway for North Pole expeditions and of course the North Pole Marathon. Finding the perfect ice-floe for the camp is challenging. The floe must be oval-shaped, detached from the surrounding sea ice and must be at least 2km’s long a runway can be built. According to sources this year, the ice is pretty solid from 1.60 to 1.82 metres, which is enough to land the plane and the 2018 North Pole Marathon competitors. I’ll let you know how we crack on next time. Plunging into ice cold water to compete in a swimming race did not sound like fun, but for nearly 1500 participants the World Winter Swimming Championships was the highlight of their year. 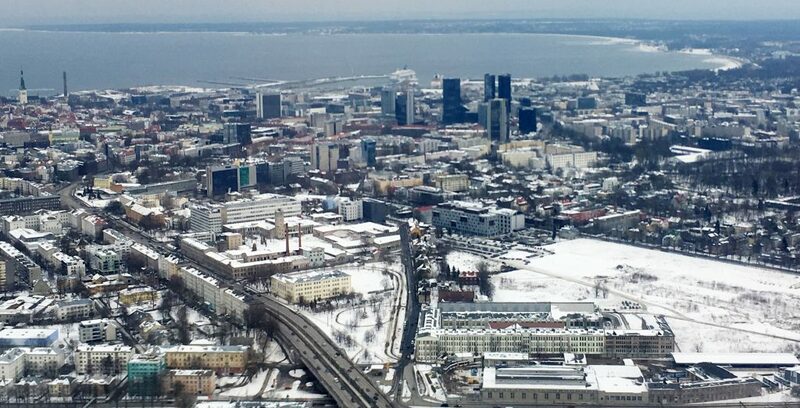 Tallinn in Estonia was the host for this year’s championship, from the air it looked a small compact city on the coast, dusted in snow giving it a winter wonderland appearance. On the ground temperatures were around zero degrees Celsius, but the wind chill made it feel much colder. The International Winter Swimming Association president Mariia Yrjö-Koskinen summed up the spirit of the championship “the colder the water, the warmer the welcome”. Over 35 nations took part from as far afield as Australia, Brazil, Argentina, the US, Europe and even a competitor from Mongolia, with the youngest just 10 and the oldest at 93. According to most of the swimmers it gives you a real legal ‘buzz’ making them feel thoroughly awake and revitalised. Many also are quick to report the therapeutic benefits of cold water swimming. Getting into effectively ice water is a shock to the system so to enjoy the sport; you must first learn to overcome this shock and continue to breathe! Organisers in Tallinn had built the pool area adjacent to the harbour side, which measured 25 x 12 metres, with 10 lanes. There was a festival atmosphere with hot Jacuzzis and saunas where competitors could warm up after their ice cold heats. Races distances were 25 or 50 metres, breaststroke, butterfly and freestyle as well as 4 x 25 metre team relays. Spread over 5 days there was plenty of free time to visit Tallinn and the surrounding area. The Old Town was charming, but the highlight for me was the Gala dinner venue, the Seaplane Harbour maritime museum. Dinner beside the Lembit submarine was somewhat surreal, especially with a live band performing at the top. However, the most enduring memory of this event was the camaraderie amongst participants. People come from across the globe for this bi- annual event as strangers and left as friends, a potent reminder of what sport is all about! Three weeks ago I had the privilege of covering my 4th World Marathon Challenge. 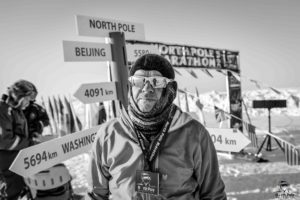 The event is a logistical, physical and extreme challenge for not only the 50 athletes from around the World who would complete seven marathons on seven continents in seven days, but also for us press chaps tasked with capturing the event. In my mind, this is one of the toughest endurance races on earth. In completing the challenge, the runners ran 183 miles, travelled approximately 24,000 miles around the globe whilst experiencing nearly 50° degree temperature changes, sleeping in the air and living off of airplane food, all in less than 168 hours. This year the locations had changed from the previous three challenges. The group congregated in sunny Cape Town on the Sunday evening and went through the itinerary, checked equipment and talked through the logistics of the challenging schedule. We were to leave on Tuesday 30th January and head off to Nova, a Russian Air Base on Antarctica for the first marathon. From there it was a six hours flight back to Cape town, then on to Perth in Australia follows by Dubai, Lisbon, Cartagena (in Columbia) and finally to South Beach in Miami. Among the athletes this year was a woman called Johanna Garvin. She was attempting to become the first person to complete all 7 marathons on 7 continents in 7 days in a wheelchair assisted by two fellow Australian runners – James Alderson and Steve Birnie. Johanna was born 11 weeks prematurely, and at just three days old Johanna suffered a severe lung haemorrhage and a stroke, which lead to a diagnosis of cerebral palsy at the age of one. Alderson and Birnie took it in turns to alternately push Garvin in the customized wheelchair. 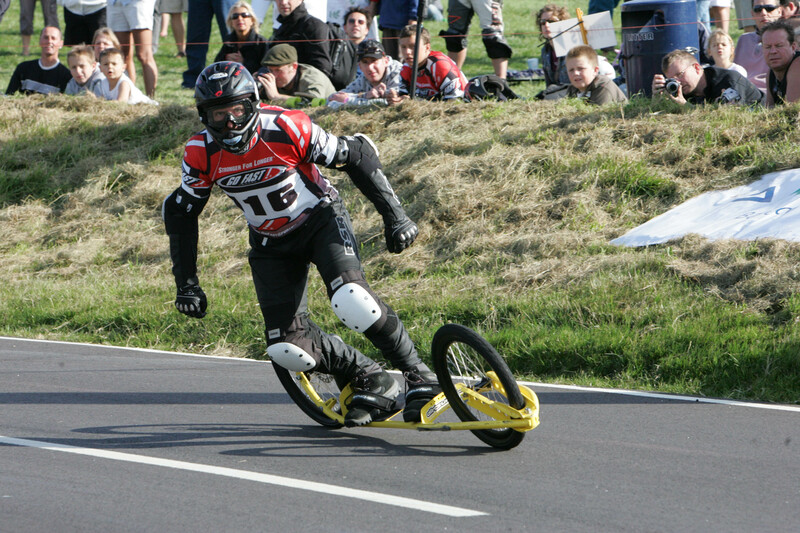 The aerodynamic chair, which cost around $4,000, had one wheel at the front and two wheels at the back. The chair also has six different sets of wheels, specifically engineered for the various terrains they encountered. The trio took on average between four to five hours to complete each of the marathons. Travelling with the rest of the able bodied group was not easy, as transit through customs was always a challenge on such a tight schedule. Team Johanna was running to raise money for the Cerebral Palsy Alliance based in Sydney. To date they have raised $64,000 (Australian dollars) for the charity. Recycling on a Grand Scale! It was a stunning winter’s morning as I meandered down the motorways towards the Cotswold’s in Gloucestershire. I was here to film a report on a large-scale green revolution that has been going for several years at the local airport. I was always under the impression that planes that were past their sell-by-date were rotting away in some vast American desert in 100-degree heat. So I was quite surprised that these beasts of the skies are now-a-days nearly 100 per cent recycled. I had arranged to meet Mark Gregory, who is the big cheese behind Air Salvage International. His business is thriving and the company is now the biggest in Europe processing over 50 planes a year through its Cotswold facility. He was telling me that the economics of plane production have reduced the price of new jets to such a level that aircrafts are now retired much younger as the core value of spare parts can fetch more than the aircraft, as an airborne asset. The programmed age for retirement was normally around 25 years but it is now common for perfectly good working jets to be retired at 15 years. For new generation aircraft up to 95% can be recycled with the removal of 1000 – 2000 parts. To preserve the value of the parts, each item needs its documentation, to prove that it has been taken from the aircraft, a little like its own passport, without this provenance the part is worthless. Every part must be carefully dismantled and labelled, a skilled yet somewhat arduous task. A 737 can take up to 6 weeks to dismantle. Whilst the engine is the most valuable asset, surprisingly it is the airframe itself that is least valuable, but even that is recycled as scrap metal often finding a new form such as a beer or coke can. Now have I forgotten anything? Luckily I was a boy scout when I was much younger and that taught me to be prepared for anything. But, figuring out what to pack before an overseas assignment that visits all 7 continents in 7 days can be somewhat daunting. 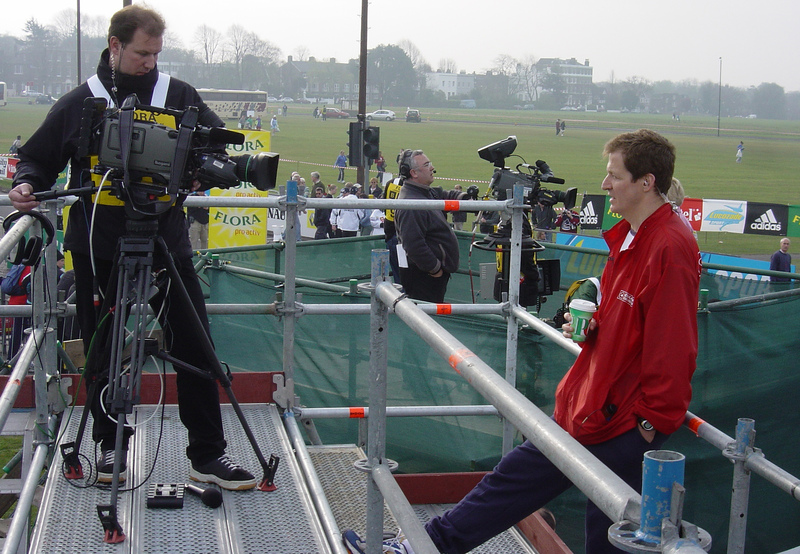 I have been very fortunate; next week it will be the 4th time that I have covered the World Marathon Challenge. This year, the event takes 55 athletes from around the World to run seven marathons on seven continents in seven days. The runners will complete 183 miles, travelling approximately 28,000 miles whilst experiencing nearly a 50 °degree temperature change. If that wasn’t enough, they will sleep, eat and recover in the air and also cross 16 time zones in less than 168 hours. The challenge starts in Novo (Antarctica) then heads to Cape Town (Africa), Perth (Australia), Dubai (Asia), Lisbon (Europe), Cartagena (South America) and ends in Miami (North America). 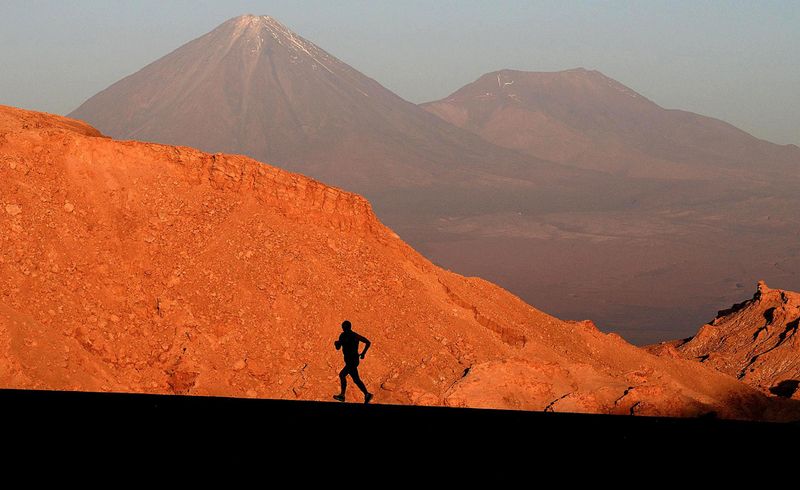 It is, without doubt, one of the toughest endurance races on earth. It tires me out just writing about it , but it is also a physical challenge just covering it for news media/PR purposes rather than a participant. So, what have I learnt to take on these trips? Well I pack sparingly; I have lost count how many times I have taken too many cloths, jackets and shoes. I take clothes that you can layer, Merino wool or synthetics work really well, also two thin waterproof tops with pockets, always useful for batteries, SD cards and the like. Lightweight trousers, buffs, ziplock bags to keep my passport, credit cards and cash dry and safe, sun cream, hat and sunglasses. I minimize toiletries with sample sizes and store everything in re-sealable plastic bags. I roll my cloths up (perhaps that’s why I also look scruffy) and also I take a smaller backpack than normal as otherwise I just fill it up with superfluous stuff. Since we will be visiting Antarctica, I am taking a down jacket, a climate motorbike base layer one piece (I have used this many times and it works a treat.) thermal gloves, Brynje beanie hat and balaclava (thanks to Rhodri at www.nordiclife.co.uk) and insulated trousers. I am discarding my polar boots, they are just too heavy – so I am hoping that trainers with thermal socks will do the trick for such a short stay. According to the schedule we will be landing in Nova and the marathon will start pretty much straight away, if there are weather delays I might live to regret this one! 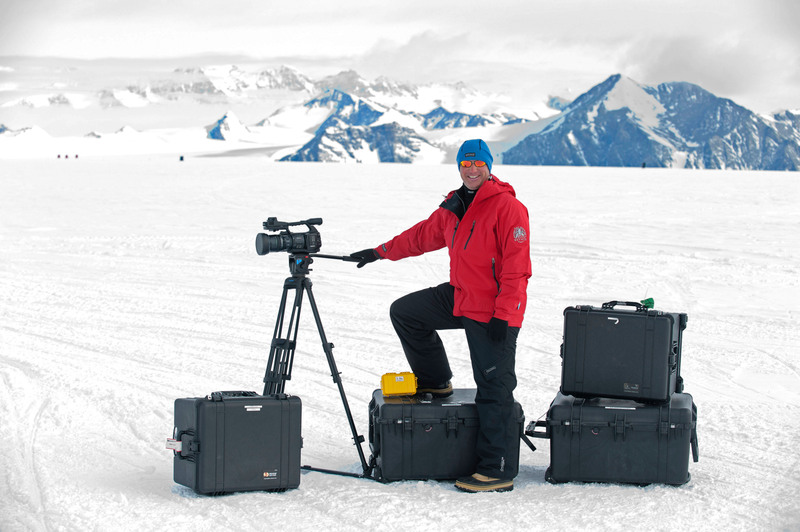 That’s pretty much it – aside from all the gear I need to do my job, camera, microphone, tripod, laptop etc.